100 Years of Philippine Cinema Dec. 1 Weve invited 2 exceptional Filipino films created by 2 award winning filmmakers from the Philippines. Ang Larawan (The Portrait) by Loy Arcenas and Lorna by Sigrid Andrea P. Bernardo. Fallbrook Christmas Parade Dec. 1 Toyland Christmas The Christmas Parade marks a special day in early December when Fallbrook residents and visitors alike come to enjoy this gift to the community. Chula Vista Starlight Parade Dec. 1 A variety of colorful floats, caroling groups, marching bands, dance teams, classic cars, and other participants will usher in the holiday season as part of SD Countys largest nighttime parade. North Park Toyland Parade & Festival Dec. 1 Vintage cars, marching bands, dance groups, beauty queens, city officials and Santa Claus. OB Holiday Parade Dec. 1 See the Point Loma Marching Band strut their way down the street or the SD Roller Derby Dolls. VW Beetle club and classic Woodies. Motorcycles, bright-lit floats and countless bands that fill the beach with live music. Lions Tigers & Bears Christmas Festival Dec. 1 Watch as lions, tigers, bears, mountain lions, leopards, bobcats and other sanctuary animals open their holiday gifts and enjoy their new Christmas trees. Silent auction, opportunity drawing, food trucks, a full bar, shopping at the LTB Gift Shop and Santa! Vista Chambers Candyland Parade Dec. 1 The parade route starts at Civic Center parking lot, turns right on Eucalyptus, right on S. Santa Fe, right on Broadway, left on Citrus, left on Main Street and ends at the Wave Waterpark. Little Italy Tree Lighting & Christmas Village Dec. 1 Families, friends and visitors will be able to experience a tree lighting, a Christmas Village with seasonal vendors, festive dcor, live music and entertainment, holiday treats, Santa Claus and more. Storytime Breakfast with The La Jolla Library Dec. 2 Delight in a breakfast buffet, variety of holiday-themed drinks, dessert and a fireside reading of Dr. Seuss: How The Grinch Stole Christmas led by the La Jolla Library. La Jolla Christmas Parade & Holiday Festival Dec. 2 Marching bands, floats, vintage automobiles and Santa Claus. Church bells peal with a fly-over. There is also a Holiday Festival and Tree Lighting Ceremony. San Pasqual Battle Day Dec. 2 Commemorating the 1846 Battle of San Pasqual of the Mexican-American war with battle reenactment, military encampment, food and entertainment. Kringle Mingle Dec. 2 Come get free photos with Surfing Santa in his vintage Camera Camper Sleigh. Listen and dance to lively musical performances. Enjoy a cup of warm savory soup from Rimels, scrumptious holiday treats and cookies from VGs Donuts and much more. Childrens Craft Pavilion. Santa by the Sea Dec. 2 Free pictures with Santa, treats, games and entertainment, plus a holiday tree lighting! SoNo Fest & Chili Cook-Off Dec. 2 40 local restaurants competing in a chili smackdown. 30 local handmade vendors. Local craft beer and wine garden. Hanukkah Celebration & Menorah Lighting Dec. 3 Celebration, live entertainment, photo opportunities, and more! Guests are invited to partake in an evening of ice skating at the Rady Childrens Ice Rink after the Menorah Lighting. Alpine Village Christmas Parade & Snow Festival Dec. 7 Imaginative creative entries for this hometown range from lights on pets and bikes to actual floats and huge trucks! The snow sledding, Santa Claus, entertainment, childrens activities and vendors begins at 7pm. Coronado Holiday Parade & Open House Dec. 7 Santa arrives via the Ferry at the Coronado Ferry Landing, a festive parade follows down Orange Avenue and Santa lights the Christmas Tree in Rotary Plaza. Balboa Park December Nights Dec. 7-8 Friends, families and the community are invited to come together for festive fun, food and attractions throughout the park, including complimentary admission to Balboa Park museums from 5-9pm. La Mesas Holiday in the Village Dec. 7-8 Walk the streets of La Mesas historic downtown and enjoy live music and dance, cozy fires, craft vendors, food, and a kids area with holiday movies and activities. Mission Bay Christmas Boat Parade of Lights Dec. 8 A distinctly California celebration, features boats decorated for the holidays that will sail around the Bay. Poways Christmas in the Park Dec. 8 Horse-drawn hay and pony rides, petting zoo, and face painting. Steam locomotive train rides, model trains, and live entertainment. Holiday sweets and warm dinner foods. Tree lighting and Santa! Oceanside Harbor Parade of Lights Dec. 8 Fishing boats, sail boats, yachts, kayaks and dingys dressed up in holiday swag and circle the Oceanside Harbor to enchant onlookers at the harbor, restaurants and beach. Santas Holiday Festival Dec. 8 Come take pictures with Santa. Each family will have the opportunity to make a memorable holiday ornament. There will be face painting, crafts and refreshments. Dont forget to do a little holiday shopping in the Gift Shop. Jingle Bell Run Dec. 8 The Arthritis Foundations original Jingle Bell Run is a fun way to get decked out and be festive, while racing to raise funds and awareness to cure Americas #1 cause of disability. Red Nose Run Dec. 9 A holiday 5K that benefits Fresh Start Surgical Gifts and Semper Fi Fund. Participants are encouraged to dress in their best Holiday apparel and a prize will be awarded. Del Dios Trail Half Marathon, 10K & 5K Dec. 9 All courses feature dirt service roads or single track trails, with elevation gains between 100-500. We are proud to offer our Kids Dash. Santa at the Lakes Dec. 9 Santa Claus, snow sledding, carnival rides, smores, food, face painting, arts, crafts and so much more! San Diego Bay Parade of Lights Dec. 9 & 16 More than 80 boats lavishly decorated sailing by the shores for all to see. The parade proceeds from Shelter Island past Harbor Island, the Embarcadero, Seaport Village, Pier at Cesar Chavez Park and the Ferry Landing in Coronado. ISA World Adaptive Surfing Championship Dec. 12-16 The ISA World Adaptive Surfing Championship serves as the preeminent platform for physically challenged surfers to display their talents in competition. 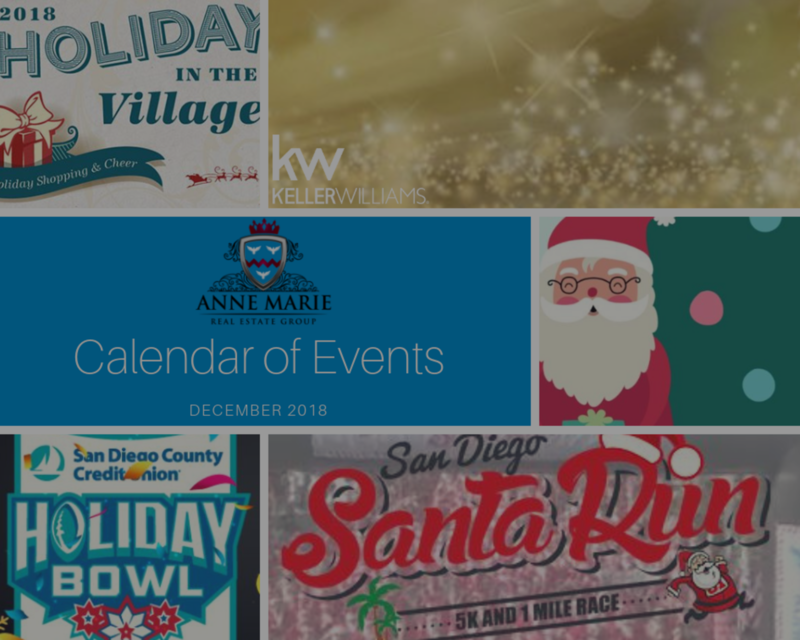 San Diego Santa Run 5K & 1 Mile Race Dec. 15 A series of runs that will take place on Garnet Ave featuring a 5K fun run and 1 mile run waves that include run with your dog, kids run, and a competitive wave. Dirty December Poker Fun Run Half Marathon & 10K Dec. 15 In addition to a costume contest and holiday theme, this run will involve a poker element your poker hand could give you bonus time! San Diego Holiday Half Marathon Dec. 15 Starts on Penasquitos Drive in front of the Hotel Karlan then travels SW along Carmel Mountain Road along the 56 bike path and finishes at the beautiful Torrey Pines State Beach. The Vet + Pet West Gaslamp Holiday Pet Parade Dec. 16 All pet owners and their furry, feathered, and scaled companions are invited to don their favorite costumes and put their best paw, wing, and fin forward for this jolly promenade and pet expo. San Diego International Auto Show Dec. 27-30 Over 400 vehicles from 30+ global manufacturers. Be among the first in the US to see more than 20 debuts of newly unveiled vehicles not yet in showrooms that are expected to be on display at the show. Solar Turbines 5K Run/Walk Dec. 31 Athletes will run past 100,000 cheering spectators. Runners, families and spectators can watch the remainder of the parade that features colorful floats, bands and inflatable characters. SDCCU Holiday Bowl Dec. 31 This signature San Diego event annually showcases a thrilling game between some of college footballs most competitive conferences, the Big Ten and the Pac-12.